“Withdraw into yourself and look. until a lovely face has grown upon his work. ROLLO REESE MAY (21st April 1909–22nd October 1994) was a highly respected American existential psychotherapist, best known for his work on anxiety and the awareness of death. Drawing on the philosophical works of Jean-Paul Sartre, Martin Heidegger and Søren Kierkegaard, May believed that anxiety, rather than being a symptom to be removed from the psyche, is, in fact, a gateway to an exploration into the meaning of one’s very own self. He also believed that anxiety was an opportunity for creativity and a stimulus toward taking action and being courageous; in short, understanding what it means to be human. Finally, in the spring of that second year I had what is called, euphemistically, a nervous breakdown. Which meant simply that the rules, principles, values by which I used to work and live simply did not suffice anymore. I got so completely fatigued that I had to go to bed for two weeks to get enough energy to continue my teaching. I had learned enough psychology at college to know that these symptoms meant that something was wrong with my whole way of life. I had to find some new goals and purposes for my living and to relinquish my moralistic, somewhat rigid way of existence. In the United States nowadays I would have gone to a therapist. But then, in 1931, I was in a psychologically primitive culture where only a few people spoke my language. What to do? I realized that I had not listened to my inner voice, which had tried to talk to me about beauty. I had been too hard-working, too “principled” to spend time merely looking at flowers! It seems it had taken a collapse of my whole former way of life for this voice to make itself heard. This inner voice hereafter would always be redolent with the slight perfume that covered the hillside that morning. Beauty is the experience that gives us a sense of joy and a sense of peace simultaneously. Other happenings give us joy and afterwards a peace but in beauty these are the same experience. Beauty is serene and at the same time exhilarating; it increases one’s sense of being alive. Beauty not only gives us a feeling of wonder; it imparts to us at the same moment a timelessness, a repose—which is why we speak of beauty as being eternal. This is why, when we are before an image of beauty, we instinctively remain silent. We look and we listen. When we talk too much about beauty, we are objectifying it, putting it outside ourselves, destroying the inner visions and reducing it to objective chatter. We must preserve the capacity for wonder—which is the awareness that we can never fully explain the inner experience of beauty. Rollo May, The Greek Monk. It was, so I had heard, a land where silence and serenity were an essential part of its beauty. I sought neither the wisdom of men nor conversation with the monks. I wanted to be quiet with my own heart and open to my own spirit. I sought especially the answer to the question of the relationship of the beauty of nature to the Infinite, to what some people call the Absolute and others call God. It was thus a strange kind of expectancy that I felt as I sat with my companions on the ship’s deck looking at the stars gleaming in the endless black void of nothingness. A surprising number of authors have gone to restore their souls in the silence and serenity to be found at Athos. The modern Greek novelist, Nikos Kazantzakis [author of Zorba the Greek], when a young man, had come there with a companion some twenty years after we were here. 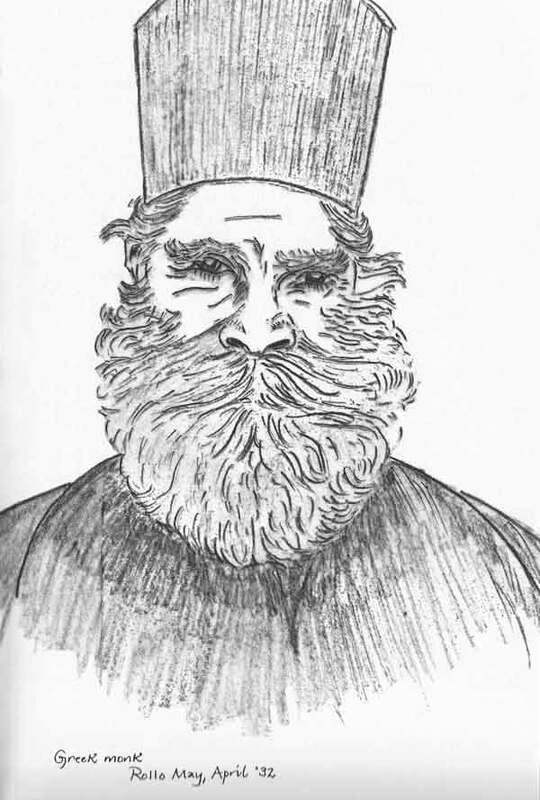 He had been seething with spiritual confusion. In the course of his walks, Kazantzakis had long talks with monks … and with hermits in caves on the cliffs over the Aegean Sea. Sister, speak to me of God. Yes. But there were still things I yearned to know. Is beauty at least our pathway to the spirit? Is beauty the gateway to spiritual enchantment and to the serenity of eternity? Is beauty related to the eternity of death? 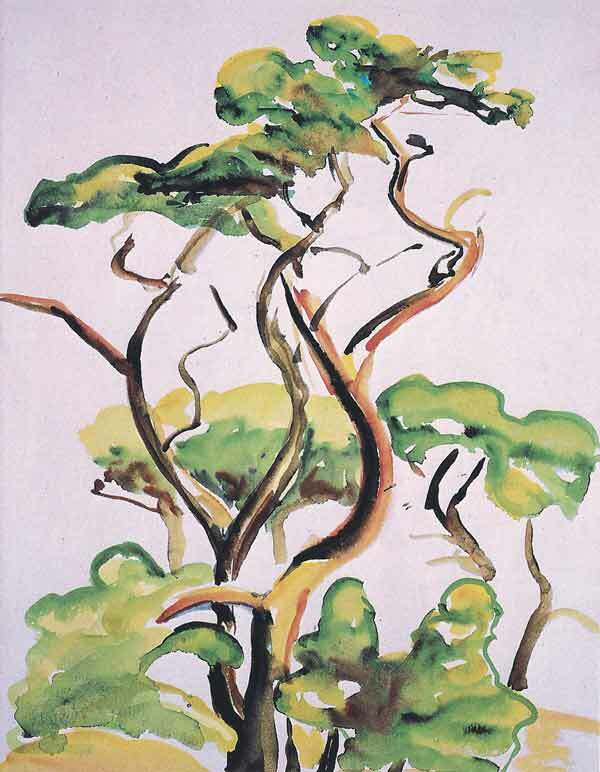 Rollo May, Curling Pine Trees. 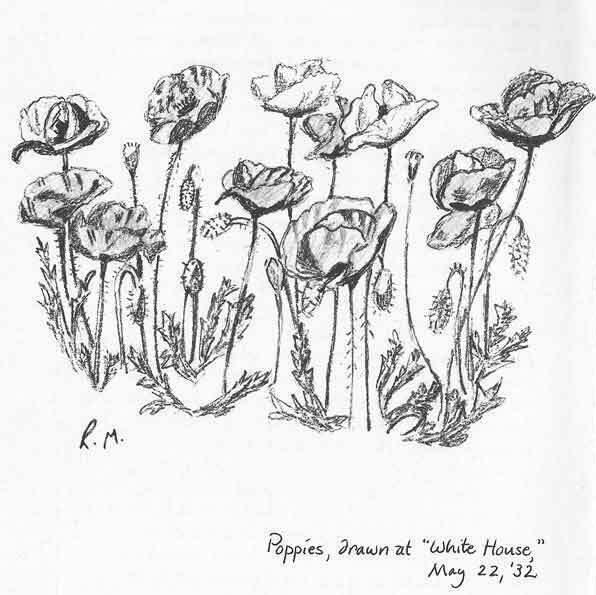 They began with that historic drawing of poppies which meant so much because it was the opening of new worlds to me. 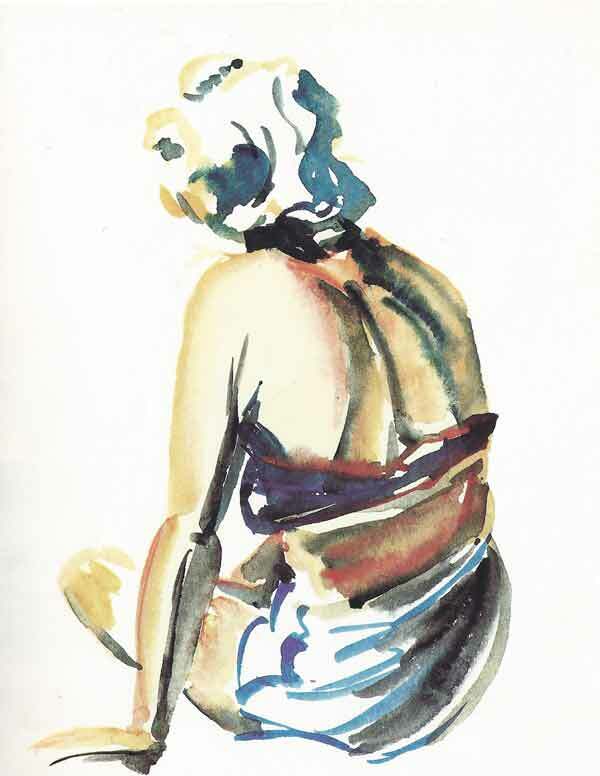 Painting is not something done chiefly with a brush and some colours. It is, rather, a way of seeing the world … One’s actual painting is done inside one’s imagination and it is a function of how the individual relates to the world. The threadbare story of the blind men feeling the elephant and saying it is like a rope, a piece of leather, a rug and so on, is true on a more profound level. Each of us sees the world as an individual, alone, caught up in a vast maelstrom; but by our culture, we learn to communicate with our fellow human beings. Poetry, dancing, painting and other arts are all ways of communciating. The philosopher Kant said we not only see the world but the world conforms to our way of seeing it. This is certainly true in the field of art. The contribution of art is that, in our threescore and ten years on this planet, we are enabled to share, to give to each other, to communicate, to love the world and, in the broad sense, to love each other. This will sound strange to those who think the world is a cold mass of whirling star dust but not to those who can form their world in communication by whatever beauty they can see and experience. The anxiety in creating—which we see most clearly in persons like Alberto Giacometti [Swiss Surrealist sculptor] or Michelangelo or Beethoven—is overcome by playing … this playing (which may also be hard work) is our human way of overcoming the dualism—finite and infinite—in producing a work of art. The art unites both of these. The world becomes lonely no more, for one experiences being an integral part of it. Beauty reveals a form in the universe—the harmony of the spheres, as Kepler called it. It is a form which is the circling of the planets. It is a form which is felt in the curves and balance of our own bodies. And it is present especially in the way we see the world, for we form the world in the very act of perceiving it. The imagination to do this is one of the elements that makes us human beings. There is a danger in erasing chaos too easily, for it then takes away one’s stimulation. Several years ago, I took the training for transcendental meditation. I have always been interesting in meditating and have done it more or less on my own. When I finished that course and my mantra was given to me, I was instructed to meditate twenty minutes in the morning as soon as I woke up and twenty minutes at four or five o’clock in the afternoon. So I, being an obedient soul, started out doing that. I found that after meditating I would go to my desk in my studio and sit there to write. And nothing would come. Everything was so peaceful, so harmonious; I was blissed out. And I had to realize through harsh experience that the secret of being a writer is to go to your desk with your mind full of chaos, full of formlessness—formlessness of the night before, formlessness which threatens you, changes you. The essence of a writer is that out of this chaos, through struggle or joy or grief—through trying a dozen or perhaps a hundred ways in rewriting—one finally get’s one’s ideas into some kind of form. So I learned I had to meditate with discretion in the early morning in order not to lose the chaos and to choose those times when I had finished the day’s work and was ready to be blissed out with pleasure. 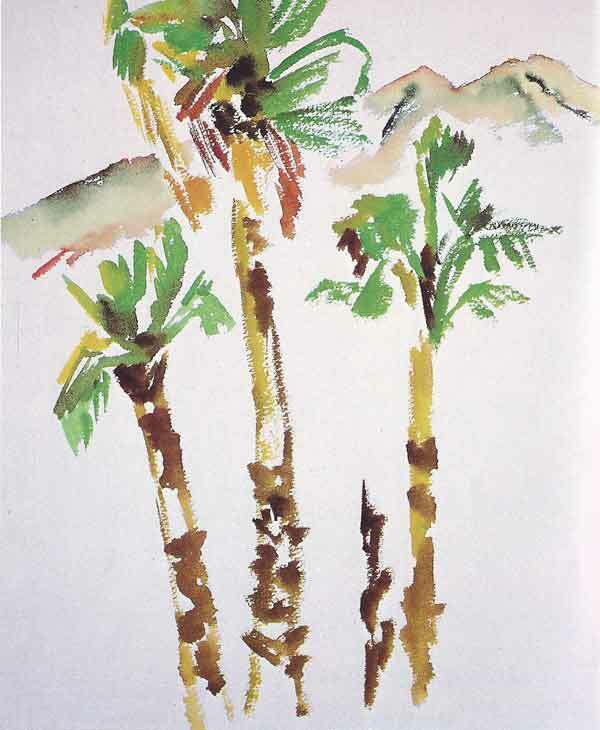 Rollo May, Three Palm Trees. We arrived in Chamonix after dark. Our room in the inn had a large picture window to the southeast and in the darkness we could see the vast dark lines of Mount Blanc, silent lord of the entire horizon. 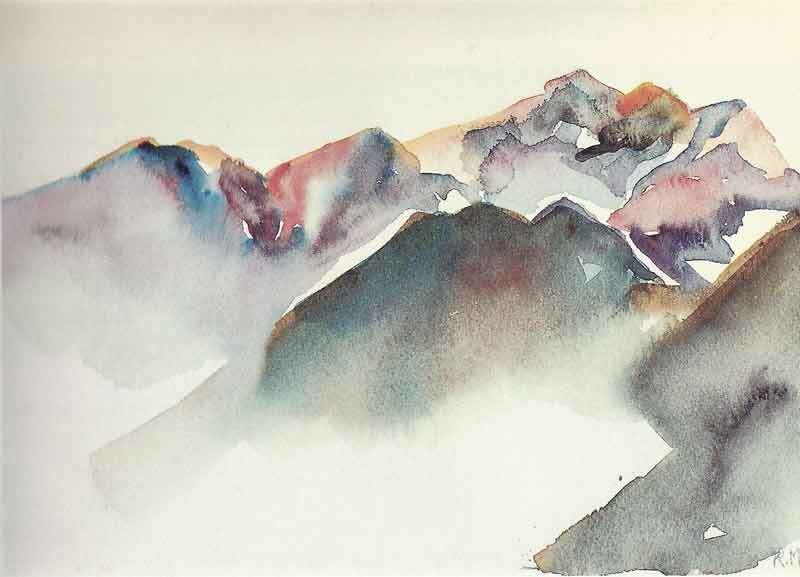 On the windowsill of the room was the customary box of geraniums, which made a foreground over which we could feel and dimly see the presence of the great mountain. The next morning, I sat on the windowsill for half an hour intensely concentrating on the mountain peak. I cleared my mind of everything and held my gaze steadily on the great cone of glowing snow. As I gazed for the first part of the half hour, Mount Blanc remained a realistic mountain, pure ivory white, incredibly beautiful against the deep blue of the morning sky. This experience of living forms, this embodied being, took me out of myself. Whenever I called it out of the past and into my mind again, it gave me a new experience which was beyond living or dying. The feeling was oceanic, as Freud of Einstein would say; it was my participation in the Being of the universe. Such an experience cannot be said to exist only in my imagination, nor is it solely a knd of ‘telepathy’ emerging from Mount Blanc. The experience is both inner and outer, both subjective and objective. 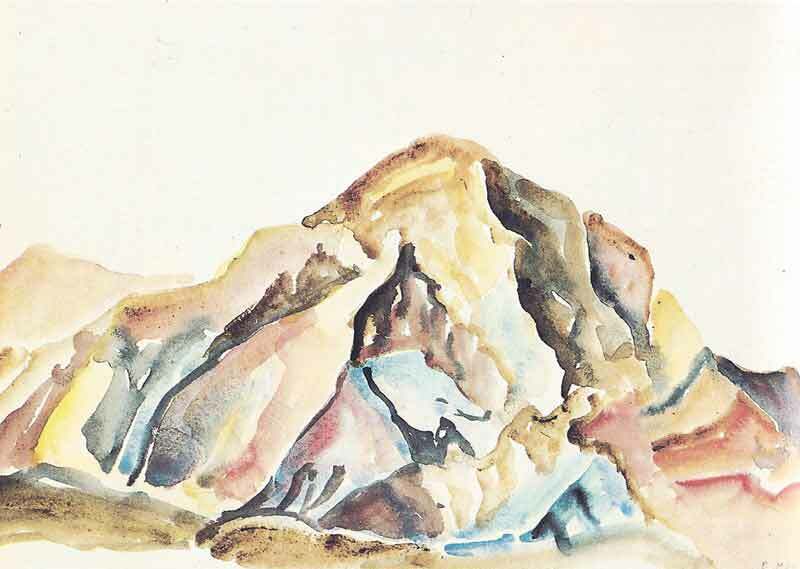 It is a fusion of my imagination and the emanating form of the mountain. Rollo May, The Firey Mountain. 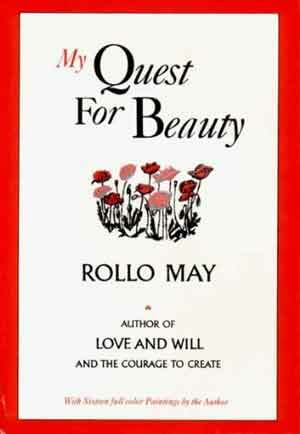 My Quest for Beauty belongs to that rare category of literature that combines both the search for universal truth with deeply personal reminiscence—Rainer Maria Rilke’s Letters to a Young Poet, Jack Kerouac’s Alone on a Mountaintop and Jean-Jacques Rousseau’s Meditations of a Solitary Walker immediately come to mind as similarly inspiring literary gems. Beauty is the form which reaches most deeply into the human heart … It is the language which translates all the moods of humanity into feelings and insights and sensual experience that we can understand. In beauty there are no foreigners: the deeper we penetrate into the human soul, be it of ourselves or our neighbours, the more we find ourselves at one with people of all nations … It is by beauty that we feel the pulse of all mankind.